I just wanted to let you know how and why the scrum format was useful for me this year in New Media 1000. The largest assignment (a whopping 40% of our mark) this semester was a “Reverse Storyboard”, where we took screenshots from the film “Run Lola Run”, reworked them following the same compositional guidelines, and then created a narrative from our reworked screenshots. This new narrative was fleshed out, storyboarded, scheduled, and shot. I was a team leader for a group of 4 students (myself and 3 others), and initially our group was struggling to keep focused and on track. Our storyboard was late and miniscule, and our planning was substandard. The group (myself included) was blaming this misadventure on “schedule conflicts”. I decided to implement the scrum format (at least in part) to keep our group on the right course. Despite all of the students in the group having different schedules, a 10 minute meeting was manageable every day. Our group sat down, discussed, and planned out a week by week (and somtimes bi-weekly) shooting schedule with iterations as key goals to achieve every week. According to the assignment [specifications], the film was to be broken down into six sequences, together totalling around five minutes in length. We created a separate Adobe Premiere (shudder… yuck…) file for each sequence, and each student was accountable for the bulk of the hands-on editing on at least one sequence, but the planning for each sequence was covered in the scrum meetings. The remaining sequences were picked up collectively; worked on by multiple group members at a time. I was the ScrumMaster, and would email the group the “minutes” every day after class, adding questions at the end of the email to spawn group discussion about the work. The scrum meetings helped us keep specific goals, (our iterations) in focus, and helped us organize ourselves into units for production, i.e – Joe and myself would shoot the scenes that only involved one of us, Joe, Lara, and myself would shoot the scenes that involved two of us, etc. This worked well for filming and for production, as Nancy, our fourth member was very restricted for time and could only film for about one hour a day, three days a week. Nancy was an interesting group member. She was very biased and uncooperative, and had no faith in the power of editing, as she had never worked on a video before (none of the group members, save myself, had). I don’t want to site specific instances, but consistantly throughout the filming and editing process, she seriously hindered the group, and was a constant source of agitation for us all. Despite this frustration, the scrum meetings served to diffuse many of the issues she caused, providing a forum for group discussion and enabling us to speak our minds without sounding too aggressive or seeming to individually attack her (often counterproductive and nonsensical) ideas. We ended up getting the best mark out of the entire class, a 29.5 out of 30. Without the scrum format I can only imagine what kind of chaos would have ensued. Thank you Garry and Mishkin for providing me with such a useful tool for group organization. Thanks Jason (named changed) for the great story! 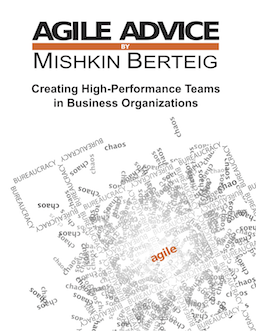 If you are interested in learning more about Scrum and how to apply it to unusual types of work, Berteig Consulting Inc. offers public training for individuals and in-house training for teams.